A very cold and sleety morning greeted the trio of young guns at Donington Park as they sought to get some miles under their belts in what were essentially new cars. 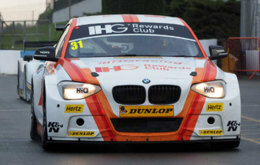 The two Mercedes Benz A-Classes of Laser Tools Racing's Aiden Moffat and WIX Racing's Adam Morgan had a host of the new 2016 BTCC parts, whilst Goff is still learning the ropes in the rear wheel drive Team IHG Rewards Club BMW 125i M Sport. In the early morning session and with the temperature under 2 degrees Centigrade it was Jack Goff that was first out on track. After only 1 lap he discovered the potential problem with rear wheel drive when he spun coming out of the old hairpin. He learnt from this immediately however and was able to complete the morning without further mishaps as he gained valuable time in very difficult conditions. 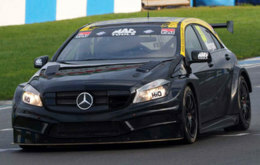 Next out was Aiden Moffat in the newly liveried Mercedes Benz A-Class. Aiden was almost immediately one of the quickest cars at the test day which included GT and Le Mans cars. Part of this speed came from the confidence of a new set-up in the car together with a new steering wheel. Aiden has opted for a slightly bigger and thicker wheel for 2016 which, together with other components, will allow him to use less lock to complete any turns required. After his initial run he confirmed that the car felt fantastic and he strongly believed that the enhanced feel had made a difference. Adam Morgan was the last out in his new and yet to be liveried car however he looked quick straight from the off and was happy to get laps and miles under his belt. Both he and Aiden are now off to Portugal for testing in a bid to get some warmer running that will provide them with valuable feedback and data ready for what is expected to be one of the most unpredictable seasons in the Dunlop MSA British Touring Car Championship for many years. 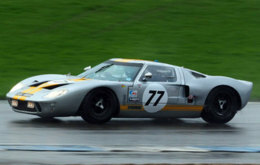 Andrew Jordan of Motorbase Performance was also in attendance at Donington Park however he was piloting a beautiful Ford GT40 that he and his father Mike run for a client. 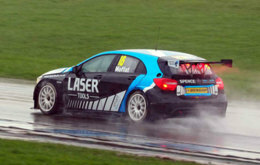 Andrew says he will be back out in his BTCC Ford Focus very soon. As more pre-season testing takes place we will bring you the best news here.